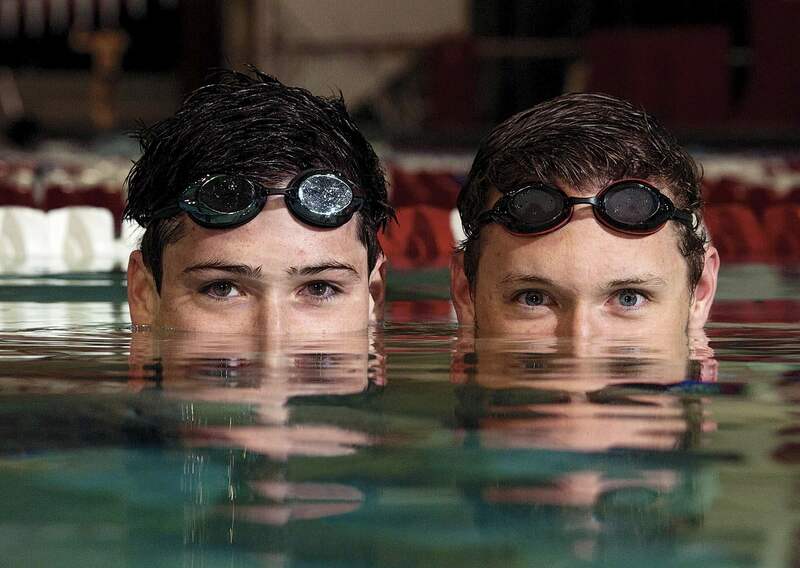 In mid November, at a swim meet among Harvard, Cornell, and Dartmouth at Hanover, spectators witnessed a rarity in college aquatics: three brothers racing in the same competition. Crimson co-captain Chris Satterthwaite ’14 and sibling Sean ’17 swam for Harvard, while middle brother Tim, a Cornell junior, raced for the Big Red. To make things even more interesting, all three swim the same events: the 50-, 100-, and 200-yard freestyle. In the anchor leg of the 4 x 100-yard freestyle relay, Chris and Tim went head-to-head: Harvard took first, Cornell third. The trio’s parents flew in from Minnesota for the meet. “You end up rooting for the kids to do well rather than to beat each other,” says Ann (MacKenzie) Satterthwaite ’84, who managed the women’s swim team in college. A former investment banker, she married Tony Satterthwaite, a Cornell-educated businessman. They started a family in England and in equatorial Singapore, where the kids all hit the pool. (“It was so hot there,” Chris recalls. “From very, very young ages we were in the water a lot.”) The youngest, daughter Katie, now a high-school junior, also swims competitively. “The only one who doesn’t swim is the dog,” Ann says. The family settled in Edina, Minnesota, in 2003. Swimmers go even faster in relay races, in which four teammates each swim a leg; relays score more points than individual events. In an individual race, a typical reaction time to the starter’s electronic “beep” is 0.7 seconds, but in a relay race that can drop to 0.03 or 0.04 seconds, and such tiny differences can be decisive. Furthermore, the first swimmer in the race dives in from the blocks, but the other three “can take two steps and almost get a running start,” Tyrrell explains. As the previous swimmer finishes his leg, “you judge how fast he is coming in and predict when he will touch the wall,” Chris says. (Diving in too soon disqualifies the team, but it’s a legal exchange as long as a swimmer’s toes are in contact with the block as his teammate hits the touch pad on the wall; electronic sensors flag violations.) The group effort seems to energize the athletes: “No one wants to have the slowest split time,” Chris explains. History suggests that Chris and Sean are more likely than Tim to leave college as Ivy League champions. Since 1994, only Harvard and Princeton have won Ivy titles—nine for the Crimson, 12 for Princeton, including the last five. Cornell’s lone championship came in a four-way tie in 1984. This year’s winner gets decided at the season-ending Ivy meet, held at Harvard’s Blodgett Pool from February 27 through March 1. Regardless of the outcome, it’s a foregone conclusion that three of the athletes having the most fun, rooting for each other, and swimming some of the best times, will be named Satterthwaite.